A once in a lifetime chance to explore an extraordinary boat. 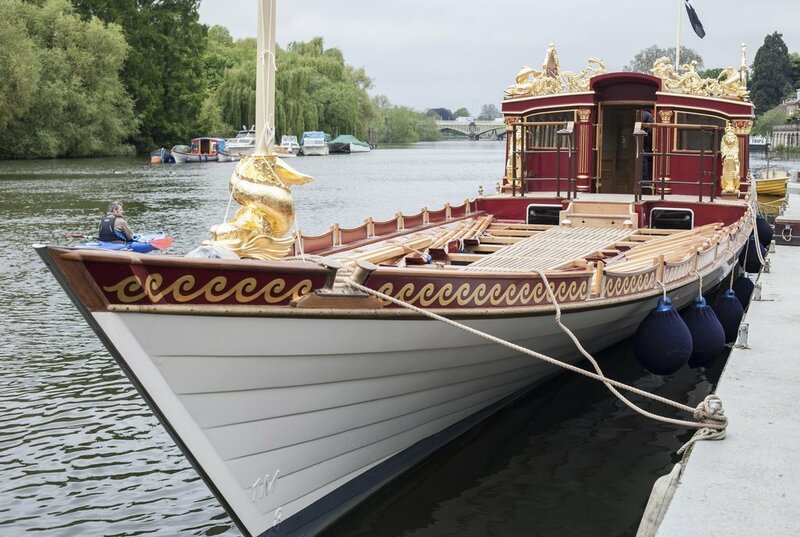 There I was last weekend, polishing a boat by the river at Richmond, when the Queen’s new Royal Rowbarge, Gloriana, pulled up alongside. Impossibly gleaming and shiny, brand spanking new, undergoing its final preparations for the Diamond Jubilee River Pageant on 3rd June. The security guard at the top of the gangway meant that I wasn’t going to get too close. That was until I spotted Mark Edwards, the master boatbuilder – not only of Gloriana, but of the Waterman’s Cutter that I was polishing. Can I come and have a look, Mark? 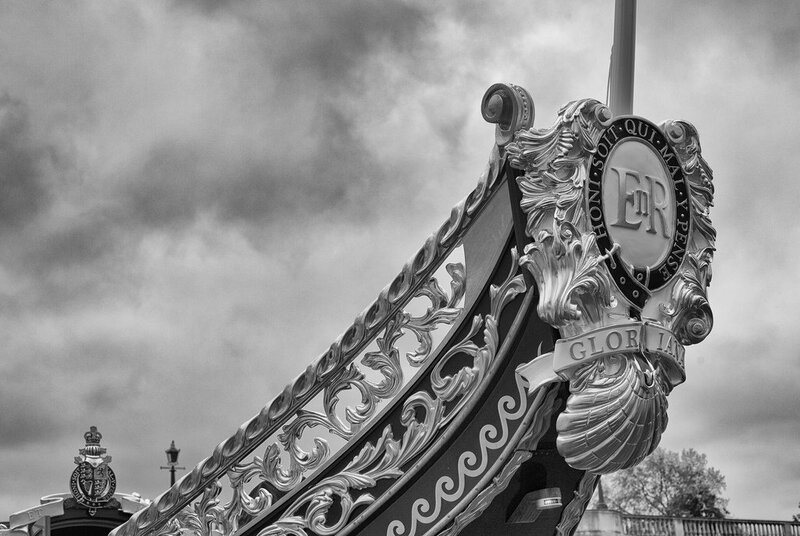 Sure – he said – and with a bit of clipboard bothering, I found myself next to, and then on, Gloriana. So, a quick post with some thoughts on what I thought was worth photographing, and why. Oh, and I had completely the wrong equipment with me. I carry the camera everywhere as a matter of course, but only had the 50mm fixed length lens, as it’s light and very portable and handy for you-never-know-what-might-happen opportunities. Like this one. So, here are seven images from a short set of 25 I made in my fifteen minutes on the shiniest boat I’d ever seen. Plenty of light, so a medium/narrow aperture at 7.1 allowing for a bigger depth of field (more things in focus). Also a low ISO for a higher quality image. Being honest, I was a bit scared of grubbying the boat, so tentatively waved the camera inside with my feet still firmly on the pontoon. 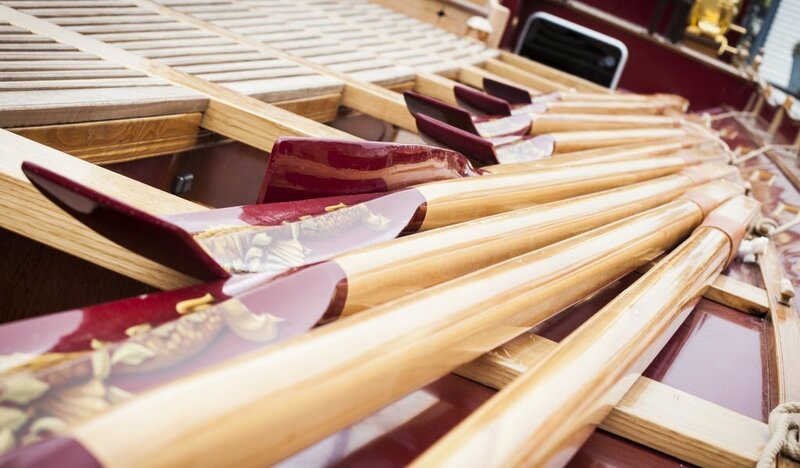 The oars were hugely appealing – I loved the detail of the fishes painted on them, and the tone of the maroon against the polished, smooth wood of the decking. Probably my favourite image. This 50mm lens, although it can’t zoom, is very flexible. 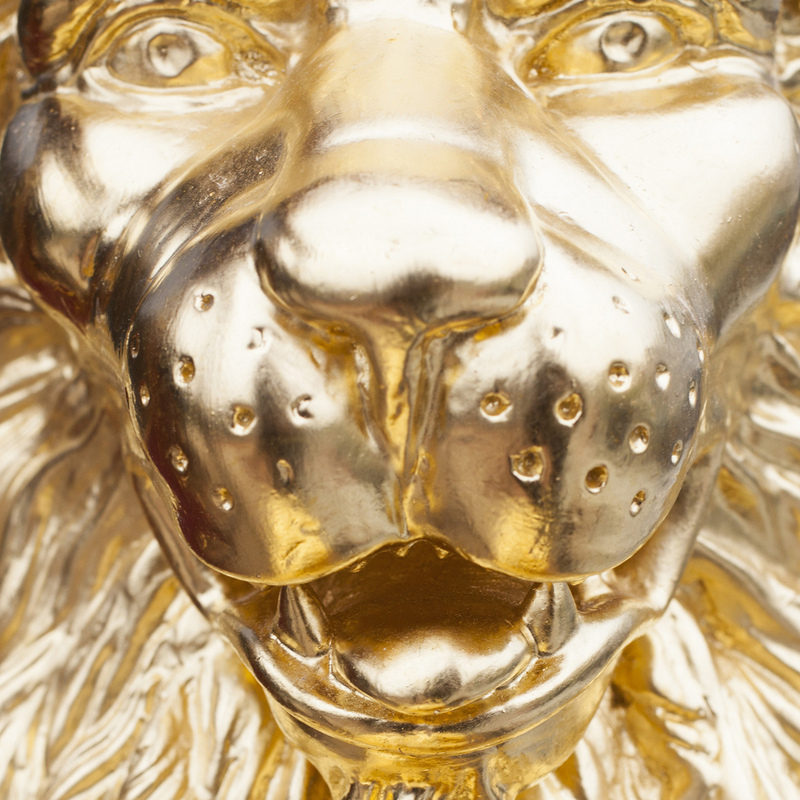 It can focus very close to its subject, and I took full advantage to try and convey some of the shiny “giltiness” of the lion. Originally a landscape aspect ratio, but it just cried out to be a bold, square crop into the face. At this point I wanted a wide angle lens very badly indeed. 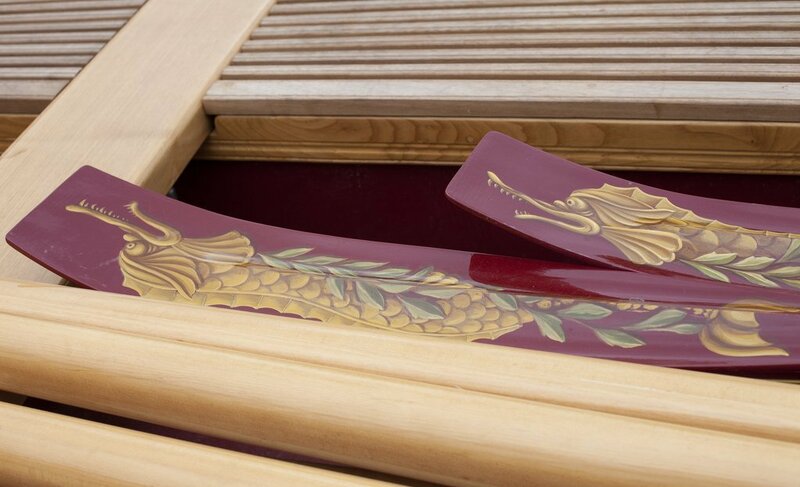 How to convey that I was now ON Gloriana – to give a sense of being at the heart of the action. This was the compromise: a view right down the engine room; one that could only have been taken on board. 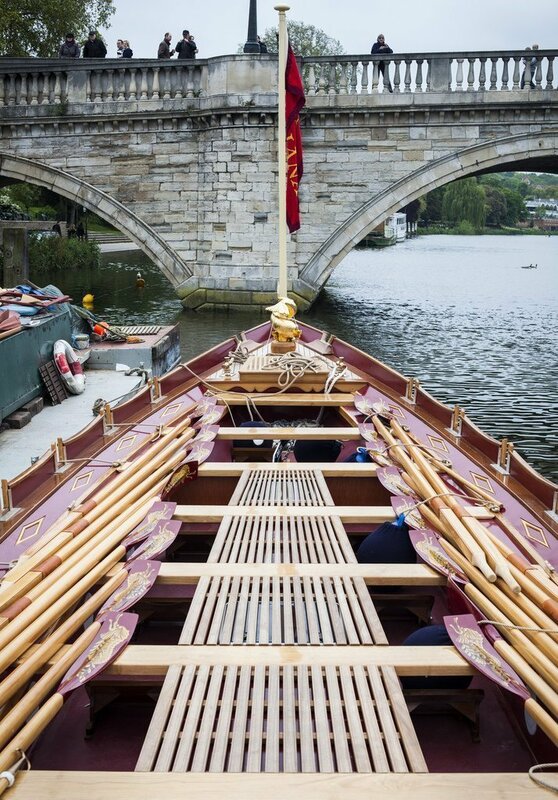 It also gave me the opportunity to set the curve of the hull against the arches of Richmond Bridge. And now for something different. 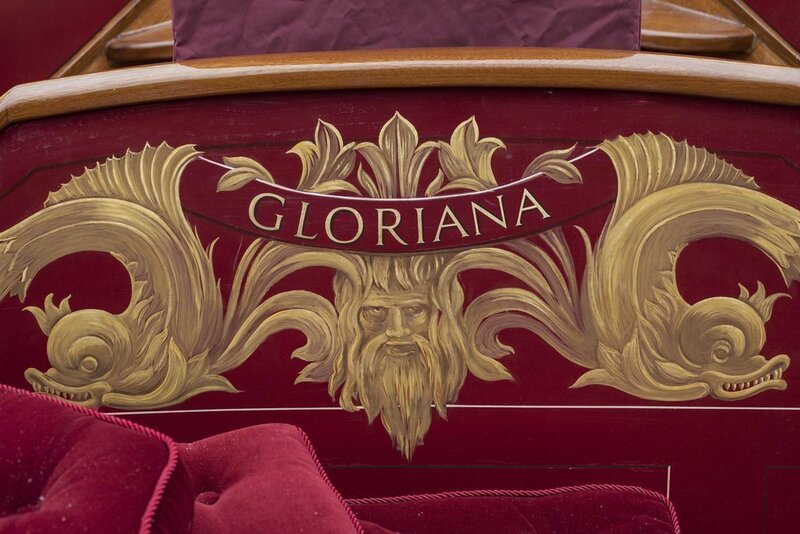 With all that gilt and goldness, what would the eye make of Gloriana if the lurid colours were removed? What impact would the curves of the curls and the crests make? Time for a fairly harsh b/w conversion, also bringing out some drama in a generally flat grey sky. One feature I definitely wanted to bring out in some way was that Gloriana was still unfinished. The Master’s seat (I guess) provided that opportunity. For all the solemn authority of Old Father Thames there in the middle, the cushions haven’t been fitted yet, and are just piled up, and there’s a distinct rime at the top of the paintwork where it’s been washed down, but not yet buffed. I’d better try and get one (non-cliched) frame of the whole boat, but with no wide-angle…hmmm. Answer: get up ahead of the bow, and as far away from the boat as I can, literally leaning off the end of the pontoon over the water, and shooting back to get the angle. Wrist-breaking, but allowed the same 50mm that picked out fine details to also catch the whole marvellous craft. All simple stuff, really. Not much variation of settings, just thinking hard – and quickly – about how to find shots that weren’t too obvious, and how to get some variety from one prime lens. You can see the whole set here (including some wider aperture, shallow depth of field stuff).